It’s been 5 days since I saw Prometheus at the IMAX and a part of me can’t stop thinking about it. Prometheus is one of those movies where the opinions seem to be quite diverse, and I thought I should jump in with my take on the movie. This will be one of my split reviews where I first give a spoiler-free review and after a big enough warning sign go into some more detail. If you’ve seen my blog posts from the past month, you’ll know that I only saw Alien and Aliens for the first time a couple of weeks ago… They’re just movies I somehow never got around to seeing, and I’m glad I finally did. I loved Aliens, but I’m not as a massive fan as some people I know, mainly cause I haven’t had as much time to invest into it as some. 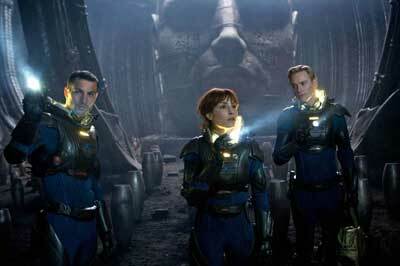 Prometheus is a sort of prequel to the Alien franchise, set 30 years earlier, but in the same universe. Elizabeth Shaw (Noomi Rapace) and Charlie Holloway (Logan Marshall-Green) are archeologists who uncover a clue to the origins of mankind on Earth, which leads them to the unexplored moon LV-223. Joining them on their mission are David (Michael Fassbender), an android, Meredith Vickers (Charlize Theron), a Weyland Corporation employee sent to oversee their mission, and a bunch of scientists (I just *love* writing plot summaries, I’m so good at it). I think the weakest part of the movie is its plot. I won’t go into too much detail here (read on after the spoiler warning for more), but it’s not the smart, intelligent sci-fi movie that I was hoping for. Half of the story feels predictable, the other half feels contrived; there are some plot jumps that depend on stupid character decisions that feel forced. 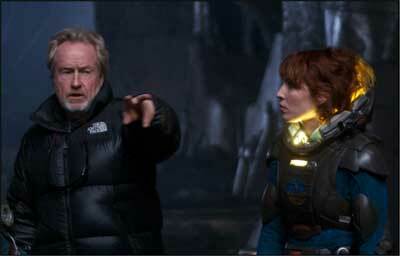 Prometheus does raise some interesting, worth-thinking-about issues, but I just wish it dealt with them a bit better. Noomi Rapace is great as Shaw, bringing the right balance of a strong yet vulnerable woman. There are parts of her character that I didn’t like, but that’s got more to do with the plot than with her acting. I constantly had a feeling there was more depth in her character that we didn’t get to see. I feel pretty similar about Charlize Theron’s character. She’s great as the bitchy ice queen, but I can’t help but think they could have delved much more into her background. The highlight of the movie though is Michael Fassbender. He’s awesome as the android, David, and has some of the best moments in the movie. Regardless of the weak plot though, I did really enjoy Prometheus. It’s not the sci-fi I was hoping it would be, but it’s still an interesting movie and one that’s worth seeing in the cinema. It’s one of the most gorgeous and well designed movies of recent years. 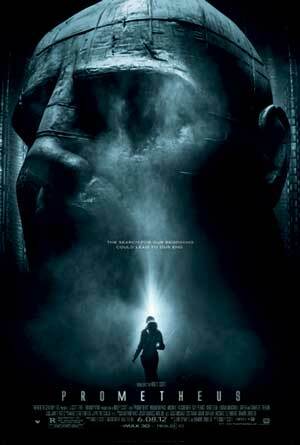 Despite all that’s wrong with Prometheus, it did make me think and I can’t help but like that about this movie. Scroll down past the photo to hear my spoilery-y thoughts about Prometheus. As I said above I’m not a huge Alien fan, so I’m not as invested in the continuity as some other people might be. In general, I think Prometheus almost did a pretty good job with being a sort of prequel: it’s set in the same universe, on a different planet, with different aliens. And up until that very last scene, it made perfect sense. Showing the Alien in that last scene though kind of ruined it for me. I might be wrong and this might be actually explained in whatever Ridley Scott has planned for a sequel, but how I see it is that they’ve now implied that Aliens are part “weird beige monster”, part Engineer and part human. That would mean that somehow the Alien from Prometheus ends up being on the planet of Alien and Aliens, or there was another combination of monster + Engineer + human. If it wasn’t for that final scene though, I think I would have been perfectly happy with the continuity of Prometheus (I’m open for anyone pointing other stuff out though). My main gripe with Prometheus is how weak the story is. The more I think about it, the more holes I keep discovering. Not considering the continuity aspect, a lot of the plot seems flimsy and predictable. Shaw’s pregnancy, Weyland being on board the ship, Vickers being Weyland’s daughter; you could see those plot twists coming from a mile away. Which would have been okay if they then had any impact, but each of them get handled in too quick a manner which didn’t feel right. Besides that the underlying motivations of each character seems off; they all make decisions that don’t follow what we know about them. Why doesn’t Shaw get angry with David about her pregnancy? Some meaningful glances between them show that she clearly knows that he was behind it. Why is Vickers even on the ship? She’s mentions something about not wanting to be stuck in a board room, but wouldn’t it have made more sense if she was forced to be on the ship because of Weyland? And don’t get me started on the so-called “scientists”. They make some of the most idiotic decisions in the movie, jeopardising their own mission. Taking off your helmet in a complete alien environment? Trying to pet a weird worm-like creature? Yes, they’re scientists and they’re supposed to be on a ground-breaking, brave expedition. That doesn’t mean that they should throw caution in the wind and act like complete dumb-asses. Finally, let’s talk about the “aliens”. I like the whole concept of initially having a virus as the monster, but I never got that claustrophobic, scary feeling that the Alien movies were so good at. It touches on it lightly when Shaw finds out she’s pregnant and tries to operate on herself to remove it, but after that one scene we go back to as it was before (and she seriously recovers that quickly?!? Okay, it’s a super special medical operating device, but that quickly?!?). Viruses are interesting, but that’s mainly when you see how paranoid and scared the characters become when dealing with a virus. In Prometheus it’s mainly the viewer who is aware of the virus and how dangerous it is, but I don’t think that’s enough for it to be truly terrifying. Then in the last act we also get the Engineer. In theory he sounds scary: here’s one of the creators of mankind and he now wants to destroy us. It’s like finding out your parents want to kill you. And yet… why? It all feels hollow without there being any explanation of why the hell they now want us dead. Also: if this Engineer was “frozen” for the past couple of centuries and this planet was a super secret military base, why didn’t his home planet respond? I understand that this might all be explained in a sequel, but without this explanation the threat of the Engineers feels meaningless. What did you think of Prometheus? Did you love it? Hate it? Somewhere in between? Let me know in the comments; I’m curious to hear what everyone else thought about it!